The meeting of the FCC in New York City in 1932 was a turning point in the organization's history. 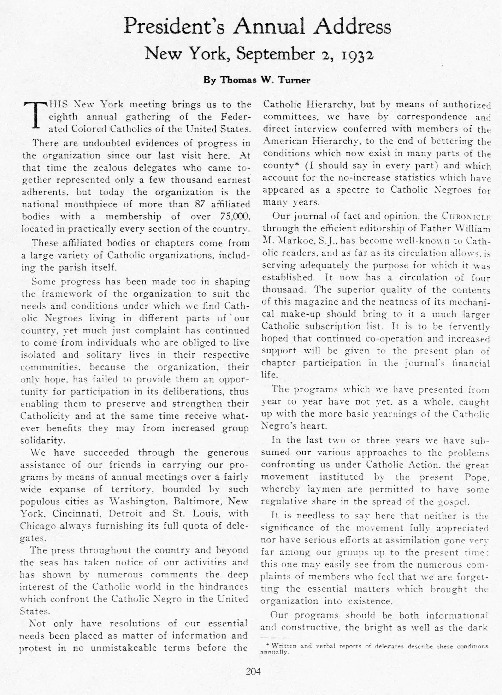 The actions of the convention included changing the name of the organization to the National Catholic Federation for the Promotion of Better Race Relations, the announcement of a new Constitution, the re-election of Turner as President, and the changing of the organization's magazine title to the Interracial Review. In his address to the 4,000 convention attendees, Turner discussed the progress made by the Federation and the challenges which remained. What does Turner claim are the concerns "uppermost in the minds" of FCC members? According to this address, have the objectives of the FCC which were set forth in its 1925 mission statement been achieved? Are the needs discussed by Turner in his address similar to the objectives stated in 1925? How had they changed by 1932? How were they the same?